This was the first time that the annual Devon and Cornwall Police dog assessments were combined with the Dorset Police dog assessments because we now work in an Alliance together. 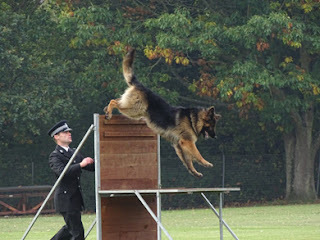 The Police dog assessments were held over 3 days from Monday 10th October to Wednesday 12th October. 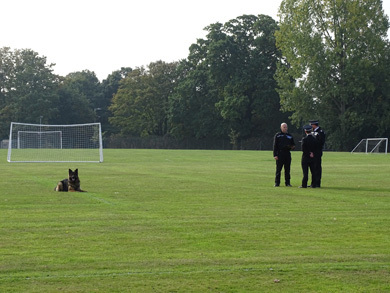 Here are the 6 Police dog teams who took part. 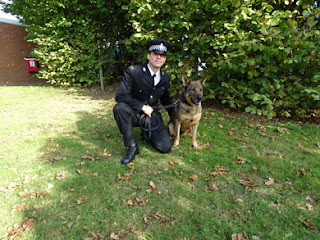 PC Stuart White and Police dog Yogi stationed at Ashburton. Yogi aged 3 was puppy walked by Terry and Jill Hodge. PC Mark Hawkins and Police dog Bess stationed in Bodmin. Bess aged 6 was also puppy walked by Terry and Jill Hodge. PC Andy Lewis and Police dog Bo stationed in Bodmin. Bo (formerly Freda) aged 5 was puppy walked by Sally and Alan Hodgson. 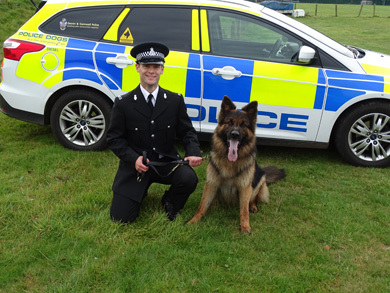 PC Simon Willan and Police dog Charlie stationed in North Devon. Charlie aged 3 was puppy walked by Diane and Mike Laity. PC Sue Hillier and Police dog Bebe stationed in Ferndown. 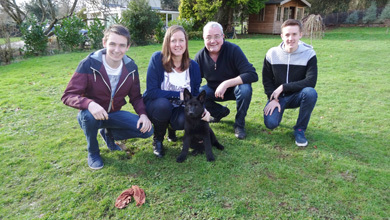 Bebe aged 2 from our B litter was puppy walked by Donna and Chris Highton. 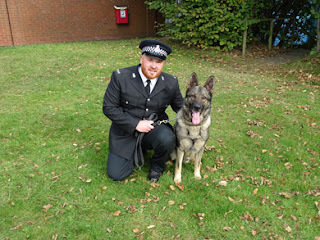 Our Judge for the trials was Graham Lightfoot a Police dog instructor from Surrey Police and a previous National Police dog champion. 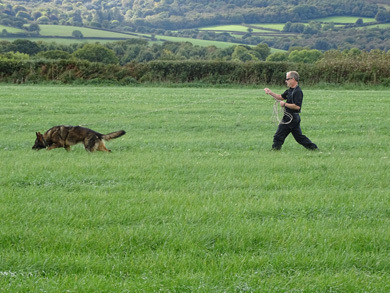 The dog teams were assessed on their ability to follow a 90 minute old trail ½ a mile in length laid across country and to recover 4 small articles hidden on the trail. 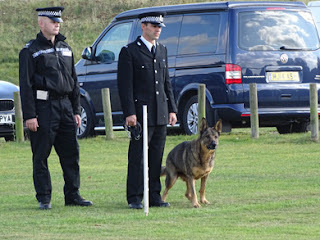 You can see the intense concentration shown by our dogs Bess, Bo and Shadow. 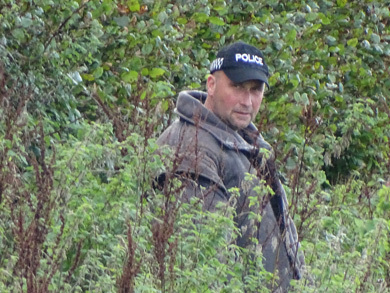 At the end of the trail they had to deal with our fleeing criminal Tim Goodwin pictured here lurking in the bushes. After breaking cover he attempted to escape from the Police dog team and as you can see Usain Bolt doesn’t need to worry about his world record. 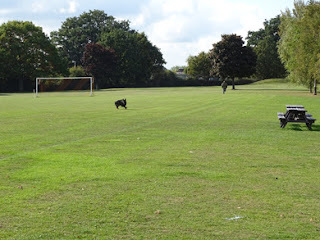 The criminal is instructed that as the dog starts to catch him up he must stop running and stand still. 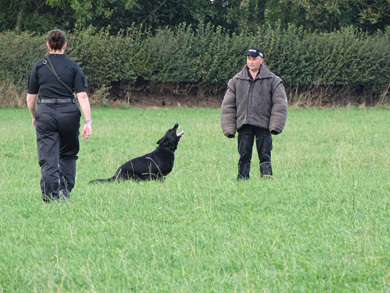 The dog on seeing the criminal stop should not bite him but should keep the criminal under surveillance until the arrival of the handler. It didn’t take Bebe long to catch our criminal and she stood out perfectly leaving the criminal in no doubt if he tried to run again she would introduce him to her pearly whites. It’s a big ask for our dogs not to bite the running criminal when he/she stands still because prior to him running away the dog has been tracking him for ½ a mile. Remarkably 4 of the 6 teams completed a full stand-off. After the long track locating the 4 hidden articles and having dealt with the criminal running away the team then had to search a large area to try and locate 4 additional items of property. This really tests their determination and stamina. 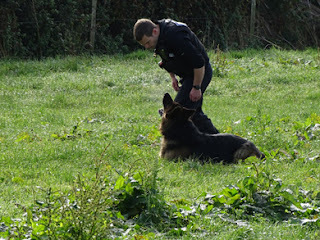 Bo is pictured here telling Andy she has found a hidden piece of property. 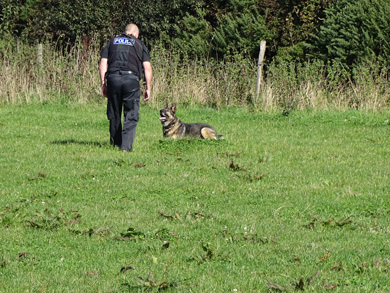 The items on this search were very small and chosen to blend in with the terrain so that the handler could not see them and had to rely on the dogs nose.. One was a small piece of Camouflage cloth which Yogi has located by lying next to it and Stuart is still struggling to see it. The dog must give a passive indication and not touch the article so as not to destroy DNA which could identify the criminal. Bebe had no problems with her stamina and loved every minute of the search. Looking at Sue she enjoyed it too. At the end of day 1 Lee Briggs and Shadow were the top team in this phase 1 section. 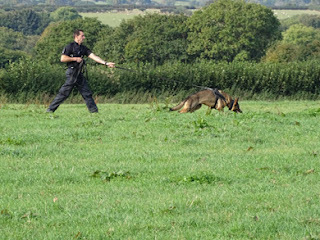 Day 2 was the searching section where the dog teams had to search an old castle type building for two offenders committing a burglary. 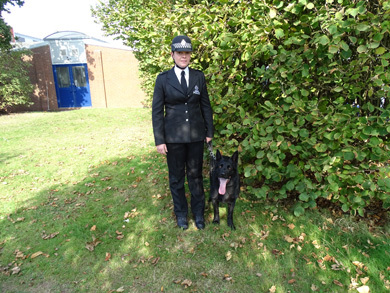 One offender was hidden in a cupboard and the other was sitting in a garden area. 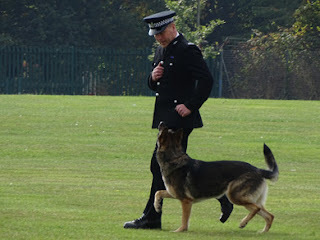 Charlie is pictured here having found one criminal and is barking to alert his handler. 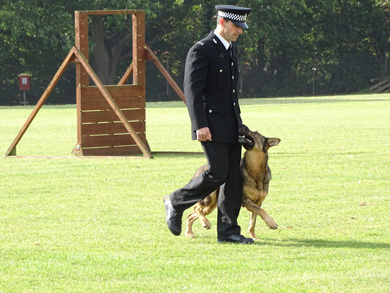 The dog must not touch the criminal unless the criminal tries to escape or offers violence to his handler or the dog. Having located and secured the 2 criminals the dog teams were then instructed to return to their vehicle. As they did so they were taken by surprise by a violent attack from a criminal brandishing a stick. 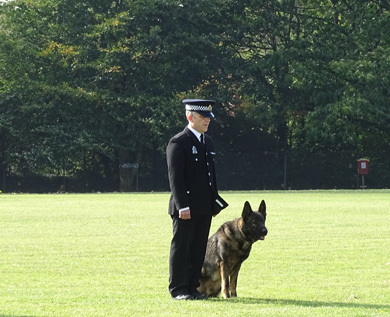 This was a test of courage where the dog was judged on how bold and determined he/she dealt with the criminal. Shadow is pictured here dealing with the criminal who is clearly coming second best in this fight. 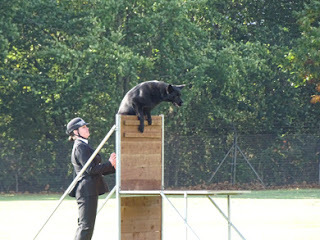 Sue Hillier and Bebe won this section of the competition and were crowned best searching team. By the end of day 2 Lee and Shadow has a commanding overall lead going into day 3. Phase 3 carries the most number of points out of the 3 phases. The teams are assessed on their obedience, agility and use of force exercises. Each competitor presented themselves to our judge and Steward PS Alan Knight for instructions. Here is Stewart receiving his instructions having left his dog Yogi in the down position before returning to his dog to perform their round. 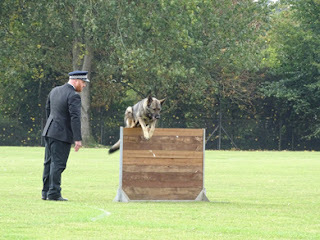 All the competitors completed the obedience and agility section and after a short break they all then did the use of force section. The obedience and agility section assesses their heelwork, general control, and agility. Here is Mark performing heelwork with Bess. Here is Bo completing the 9’ long jump with Andy. 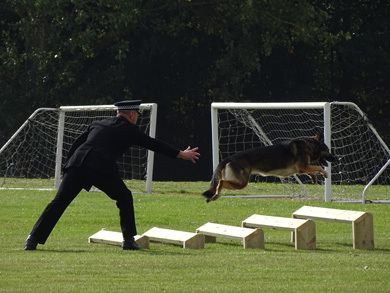 Here is Charlie performing the 3’ hurdle for handler Simon. Here is Bebe completing the 6’ scale for handler Sue. Next it was time for the criminal work which the dogs love. 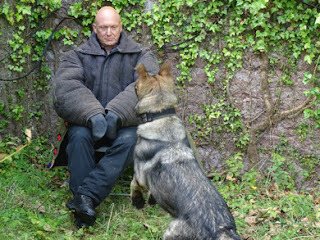 Here is Mark with Bess and its fairly clear that Bess cant wait to get started. Nevertheless she has to wait until Mark instructs her to go. The first exercise was the emergency recall. This is where the dog is sent to chase the criminal and as the dog gets 40 metres into the chase the handler calls the dog back to him. Shadow is pictured here ignoring the criminal and turning on a sixpence. 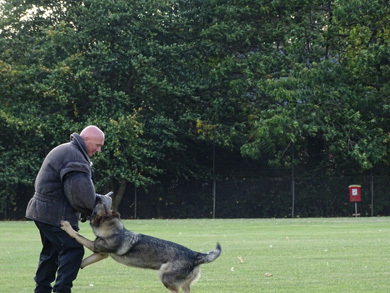 This is our most important exercise because one day it could save the dogs life. 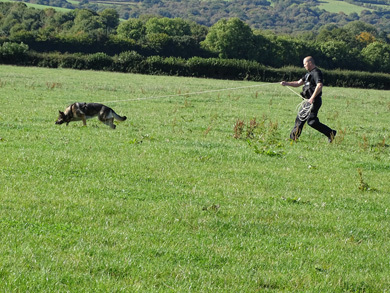 For example the dog could be chasing someone towards a main road and we need to get the dog to stop chasing urgently. Next exercise was the Stand-off exercise. This is where the Dog is sent to detain the fleeing criminal and the criminal suddenly stops running and gives himself up. The dog should not bite but should prevent his escape. Bebe is pictured here carrying out a perfect stand-off. 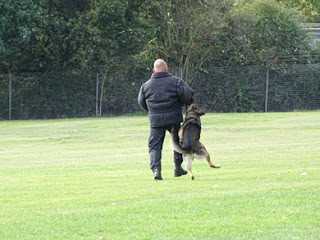 Next was the straight chase where the dog is sent to detain a fleeing criminal. 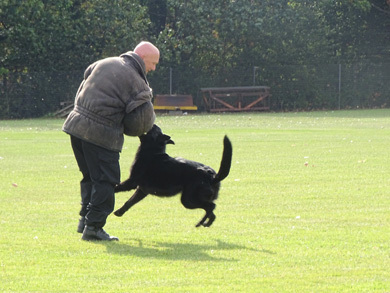 Bo is pictured here quickly gaining ground before stopping the criminal in his tracks. 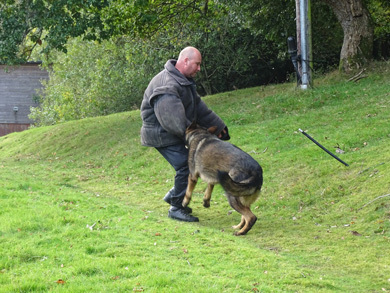 Next exercise was the stick attack where the criminal attacks the oncoming dog with a padded stick. Charlie was certainly not bothered about a padded stick and made quick work of winning this contest. The final exercise was the gun attack and Bebe showed she is certainly not one to back down from a threat. 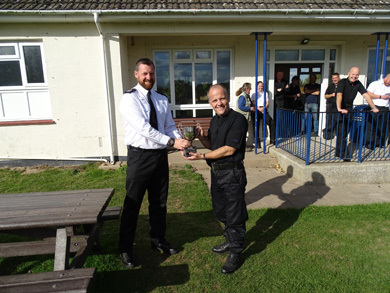 The overall winner was Lee Briggs and Shadow with 774 points and also winners of the Phase 1 cup. Mark Hawkins and Bess were runners up with 767 points and were winners of the Phase 3 cup. Such was their performance on day 3 that they finished only 7 points behind Lee and Shadow pushing them all the way. 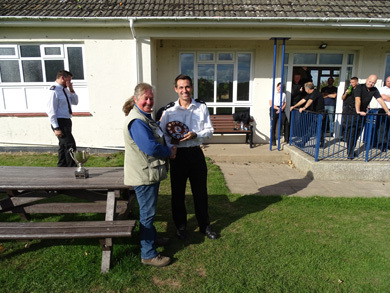 Mark is pictured here being presented with the runners up shield by our long standing puppy walker Annie Miller who donated the shield. In third place was Andy Lewis and Bo. 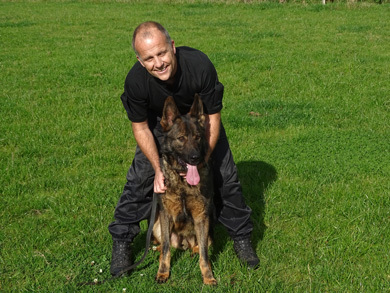 The first 3 teams now go on to the Regional Police dog assessments which are being held in Dorset from the 6th to 9th of February 2017. We wish Lee andShadow, Mark and Bess and Andy and Bo the best of luck at the regionals. 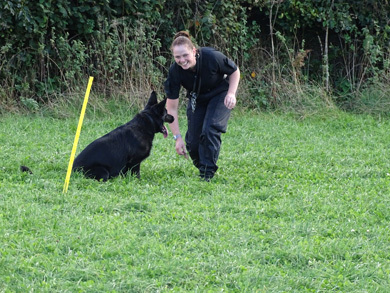 The baby of the trials was Bebe who only started operational duties in January this year and this was also handler Sue’s first experience of dog trials. 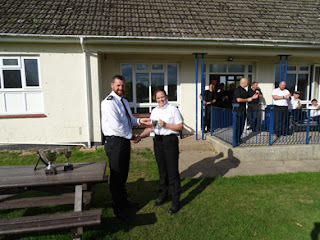 The team gave a very good account of themselves and won the phase 2 searching trophy. Bebe’s extreme determination, high drive and huge enthusiasm for work certainly tested Sue to the maximum and on occasions Bebe forgot the script but Sue never lost her composure or sense of humour. I was extremely impressed with Sue’s handling skills. 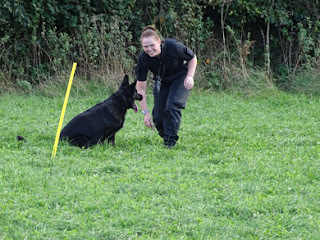 For me one of the many highlights of the trials was watching this gritty, tough little dog loving every minute of doing her work and Sue’s constant smile throughout. 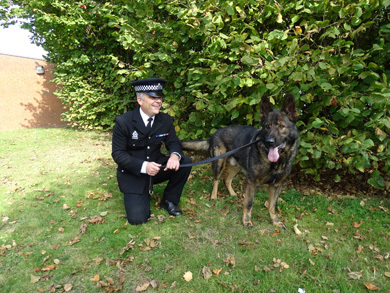 But I was also very impressed with the excellent relationship, compassion and obvious bond all the handlers displayed with their dogs. 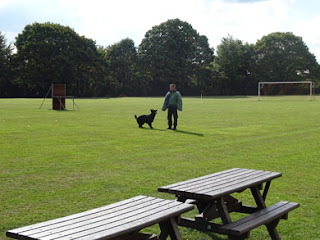 The icing on the cake for me was seeing Bebe’s puppy walker Chris watching Bebe doing her criminal work round. It has been a traumatic year for Chris losing his wife Donna to Cancer and I know he was so very proud watching Sue and Bebe perform and also winning the search cup. 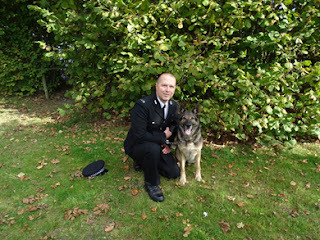 My congratulations to Lee and Shadow who were very professional throughout and worthy winners. 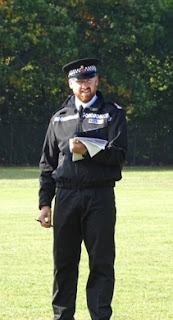 I would like to give a special thanks to our Judge Graham for taking the time out to Judge our trials. 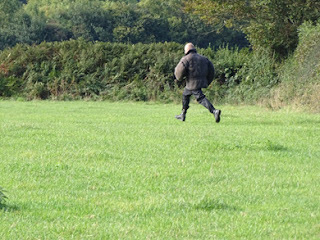 He put all the competitors at ease and set very achievable and fair tests. As always my thanks to our unsung hero’s our puppy walkers for giving these dogs the love, time and devotion which sets them up perfectly for the rest of their journey. 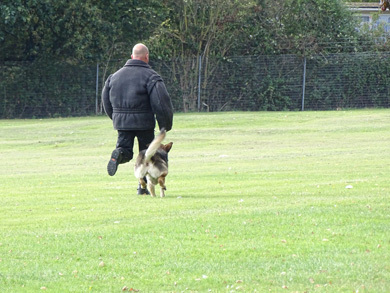 Finally as a mark of respect to Donna’s memory I will end with a picture of Bebe leaving our house to go with her puppy walkers Tom, Donna, Chris and Jake before going on to do what she was born to do with her handler Sue. Hope you enjoyed the blog. See you next time.